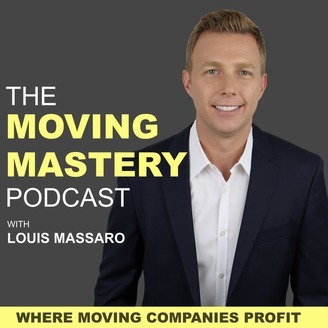 Take your moving company to the next level with Louis Massaro, the Moving Industry’s #1 Business Trainer and Success Coach. In this podcast, you’ll learn proven strategies and processes on how to reach higher levels of success in your moving business. Every week, Louis shares valuable insights, stories and expert interviews with takeaways you can implement in your business right away. You’ll also get a behind the scenes look and tactical training from Louis’s seminars and online training programs on how to improve each area of your moving business. Visit LouisMassaro.com to learn about Louis. In this episode, Louis Massaro shares how to effectively coach your existing sales team instead of rushing to hire the perfect salesperson. Great salespeople just know what to say, when to say it, and how to say it. And with the right sales process in place, you can coach anyone to become great on the phones and easily book more moves. Listen to Coach Your Moving Company’s Sales Team now! If you're an established company and you're ready to SCALE, go to www.TalkToLouis.com to learn how I can help you scale your business over the next year. Subscribe to my YouTube channel for more tips on growing your moving company. Get free on-demand video training on how to book more moves and learn The 6 Stages of a Moving Company Sales Machine. Follow me on Instagram for daily tips and motivation. Louis Massaro is the world’s leading moving business trainer and success coach. He’s the founder and CEO of Moving Mastery, a training, coaching and education company dedicated to helping moving company owners, managers and employees reach higher levels of success in their business. Through his coaching programs, online training and live seminars he’s helped hundreds of people unlock their full potential by giving them the strategies and systems to take their moving business to the next level. Louis opened his first moving company at 19 years old with two rental trucks and after overcoming many challenges and struggles, he went on to build a $20 million a year business. His company, Neighbors Moving & Storage had locations nationwide performing local moves, long distance moves as well as storage. After 16 years of success in the moving business, Louis sold his companies and is dedicated to helping others “Profit in Their Business and Thrive in Their Life”.